At a meeting of the Budget Review Subcommittee on Postsecondary Education Thursday, lawmakers heard testimony from education leaders concerned with the way state funds are distributed among state universities and see a need for a performance-based funding model. At Northern Kentucky University’s METS Center, NKU President Geoffrey Mearns explained the struggles faced by his university when it comes to funding despite high performance rates. Mearns said the way state dollars are distributed to universities based on enrollment has been in place for 15 years and is outdated. Mearns says the system hurts schools like NKU and Western Kentucky Universities who are seeing high performance numbers but students are having to pay more to attend the schools than at one of the bigger state schools. Also presenting at the committee, Council on Postsecondary Education (CPE) President Bob King began by discussing the issues faced by the higher education community over the last decade since funding began to decline. King said the state used to be a leader in education but has seen itself drop to the bottom of many lists due to the lack of funding. A common misconception, King stated, is that colleges raising tuition offsets the funding cuts they face. 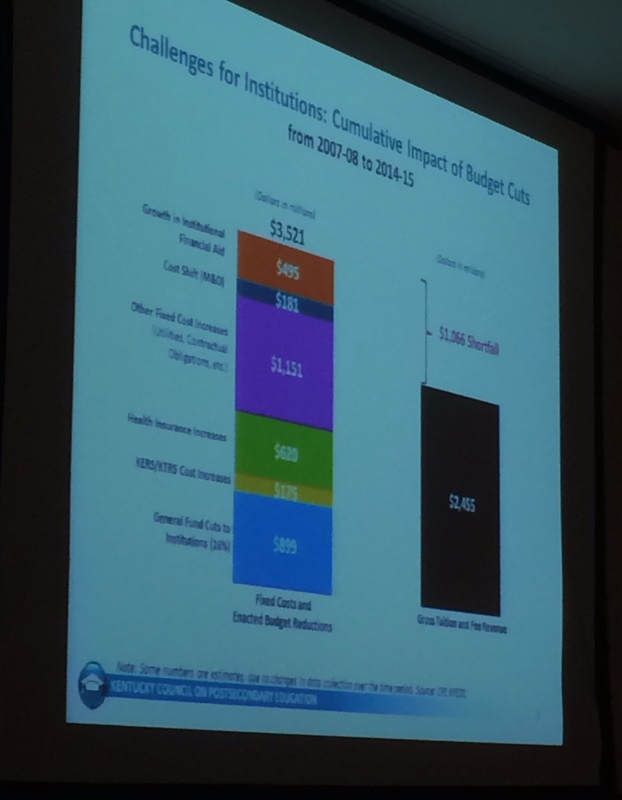 However, King said the universities have many other increased costs seen in recent years, including increased payments into the state’s pension systems, which have set them back (seen in graph). Because of all the issues faced by the universities, King said CPE has been discussing many different options for implementing a funding model based on performance, mission, enrollment, parity and adequacy. King said the group will continue working on the proposal and make a possible legislative push during the 2016 session. King explained that the university presidents have been discussing different models of performance-based funding but have not yet reached a compromise solution. a model where universities compete against a negotiated targets for amounts appropriated. King explained that both models are in discussion. The second model could revolve around a set of potential metrics decided upon by CPE and chosen for each school. A main concern expressed through questions from legislators centered around the idea that a competition structure sets the state up for picking winners and losers when it comes to who gets funding. Sen. David Givens of Greenville stated he believed the Senate could be more comfortable with a hybrid of both models to avoid such an issue. King again stated that all possibilities are in discussion.